Bower Grove School in Maidstone is a large special school for over 200 boys and girls from 4 to 16 years of age with learning difficulties, associated Autism Spectrum Conditions and communication difficulties. They introduced Sleuth in 2012. Assistant Headteacher Matt Evans explains how they use the information from Sleuth to support their positive approach to behaviour management. “As an SEMH school, the ability to track and monitor behaviour across the whole school is an important part of ensuring that we’re helping our students to improve and progress. “Prior to Sleuth we had a paper based system which was torturous to say the least and not integrated. We were tracking poor behaviour in one way and then we were looking at positive behaviour in another way. The two didn’t marry together so although we had data it was very difficult to use. “We started looking at various options only Sleuth had the flexibility to incorporate what we wanted. I could see that it also had room to move with us and to help us develop our approach. From the outset it was clear that the product is backed up by people who are very aware of our setting, how Sleuth works and how it supports behaviour management. “We’ve developed very clear systems with Sleuth. Staff record all incidents from a warning right the way through to the issuing of a card which then leads to a sanction. 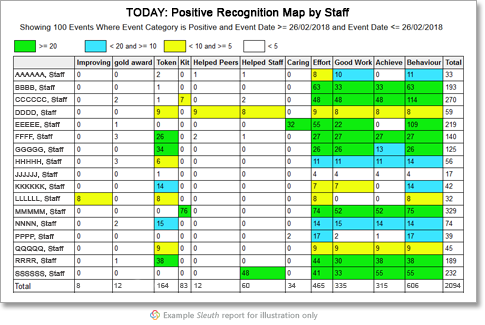 We have a lesson points system and staff recognise positive behaviour which all feeds directly into our awards system. We also note any relevant issues that may influence a child’s behaviour, medical issues, parent visits, therapies and interventions. “We’re collecting good data and in Sleuth we have an easy means to interrogate it which enables us to see trends happening with behaviour across the school. Because the information is so accessible we can be proactive now and can prevent fires rather than put fires out. “The information in Sleuth is being used at every level across the school. 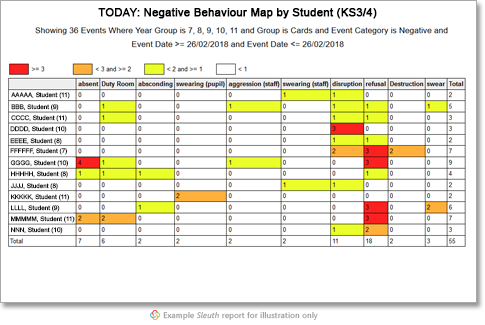 At class level there is a behaviour profile which looks at positive and negative incidents which can be further broken down to identify hotspots, periods, locations, subjects and stuff like that. As a senior leader I’m using Sleuth all the time, I’ll look at class level information but also something more specific like our use of safe rooms. I need an idea of average time in the safe rooms, which children are using the safe room, when and why. “As for the positive, we have a weekly Top 20, which is published to the whole school and those children are recognised for their behaviour. “The management team have a weekly meeting and use Sleuth to profile certain children who have high frequency over the past week. We can review the detail and identify potential reasons and work with the form teacher on the best response and plan additional support. “The governing body are also engaged, I take Sleuth reports to and I can talk through the progress of groups and individuals.